For many centuries man kind has had a love of the sky stone Turquoise. Turquoise Gemstones have adorned kings and queens crowns, Pharaohs sarcophagus and has adorned all types of dignitaries and upper class members. Turquoise is seen by many cultures as a sacred protection stone and healing gemstone. Turquoise is thought to bring good luck and fortune to it's wearers in many cultures. This gemstone is one of the most powerful Metaphysical healing stones. The most common forms of Turquoise gemstones are cabochons and beads as well as Jewelry made from each. In the below informational page we will discuss Turquoise gemstones and Turquoise cabochons in detail along with pictorial examples from different mines and locals. This is an information page on Copper Phosphate Cabs by Durango Silver Company, located in Durango, Colorado USA. We have been Turquoise Miners, Collectors and Turquoise Cabochon Cutters for over forty years. This page has some good photos, information and links to other pages directly related to this subject. The photo above is a huge Royston Turquoise Cabochon that has golden yellow to brown spider webbing running through pools of "Robin's Egg" blue Nevada Turquoise that fades into deep blue green. This is a very rare gemstone due to the great spider webbing as well as the massive size of the cabochon and the hardness of the natural gem Turquoise. Turquoise of this quality is very rarely seen and quite valuable, we are always in the market for high-grade American Turquoise rough or cut. I cut this stone years ago and am still memorized every time I look at it! This photo above shows you many variations of Bisbee Cabochons with natural spiderweb matrix. 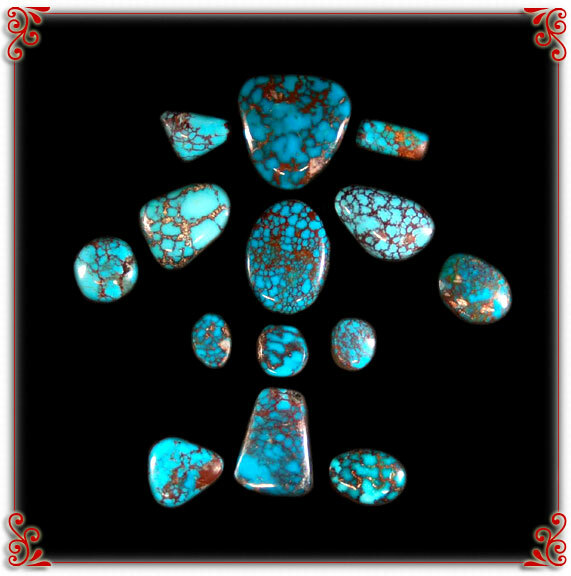 There are fourteen cabochons with red matrix, the red coloring is caused from high iron content, it is rare in Turquoise and it is highly collected by Turquoise Connoisseurs. John Hartman of Durango Silver Company purchased the Bob Mathews and Cecil Mickelson collection in 2001. Bob Mathews had the only legal contract to excavate Turquoise from the Bisbee Mine and did so with his brother-in-law, Cecil Mickelson from 1966 to 1978. 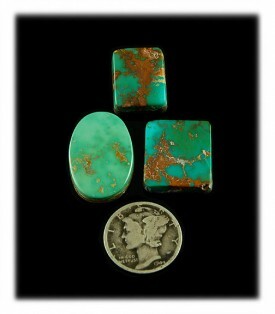 Today, the Hartman family may have the worlds largest collection of authentic natural Bisbee Turquoise. 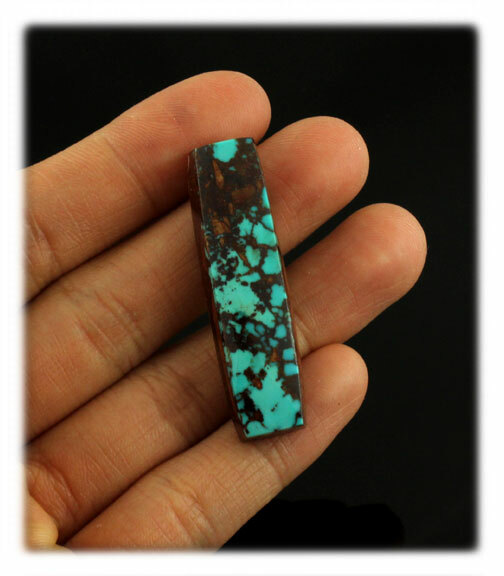 One thing for certain is that the Bisbee Turquoise Cabochons that John and Dillon Hartman cut are authentic, natural Bisbee! 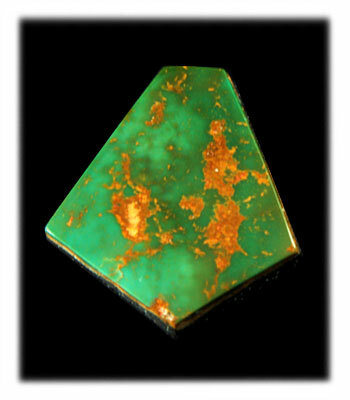 We invite you to view our Bisbee Slide Show to see many more variations of Natural Bisbee Turquoise. Check out our Bisbee Video too! If you are interested in purchasing the finest quality Bisbee Cabochons, we invite you to view what we have to offer or learn more on our Bisbee for sale page. The Turquoise Cabochons in the photo above are beautiful examples of green toned Turquoise from the Royston Turquoise Mine located northeast of Tonopah, Nevada. If you are one who likes green gemstones, Royston can't be beat as high grade Royston is dynamic and enchanting. We invite you to visit our presentation on the Royston Website. 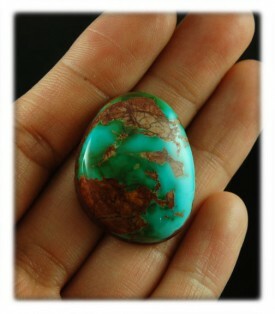 If you have natural high-grade Royston Turquoise rough or cut, we are interested in purchasing it from you! 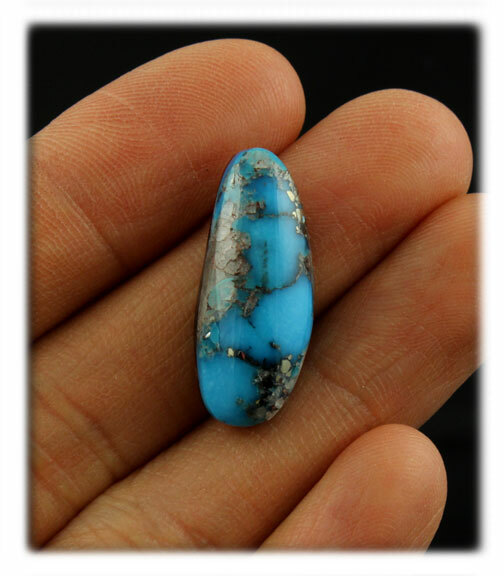 If you are interested in purchasing the best Royston Turquoise Cabochons available, Durango Silver Company is the place as we are cutters of Royston Turquoise - check this page out, Royston Turquoise Cabochons. Turquoise was one of the first gemstones known to man, it was discovered over 7,500 years ago in Egypt. Turquoise Stones cut into cabochons have been found in the tombs of ancient royalty, including King Tut. It has been coveted by spiritual leaders, pharaohs and royalty worldwide since its discovery. Turquoise was found by the Native Americans of the American Southwest around 200 A.D. and has had a historic past in this region of the world as well. It is interesting that the Native Americans had the same beliefs as others in different regions of the world - "Turquoise was put on this earth by the great ones above and it has spiritual as well as a metaphysical powers, it brings happiness, health and good fortune to its bearer". 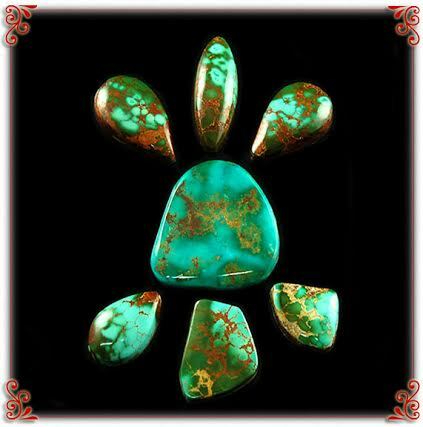 Below, you will find several good examples of high quality American Turquoise gemstones. Above and to the left is a Turquoise Gemstone from the Blue Gem Mine located south of Battle Mountain Nevada, it was in production between 1934 until 1970. This Blue Gem Cabochon was hand cut by Dillon Hartman from the Durango Silver Company Blue Gem Turquoise collection. There were actually two Blue Gem Turquoise Mines, one was located near Battle Mountain, Nevada and the other near Tonopah, Nevada. The Blue Turquoise with this coloration is from the northern Blue Gem Mine located near Battle Mountain. Blue Gem Turquoise has become very scarce and is rarely seen for sale. Above and to the right is a Turquoise Gemstone from the southern Blue Gem Mine located near Tonopah, Nevada. This Tuquoise Mine was located in the Royston Hills District, it produced a lot of high quality Turquoise from about 1935 to 1965. The Blue Gem Mine gave way to many other great Turquoise deposits such as the Royston Turquoise Mine and the Easter Blue Turquoise Mine. There are many shades of blue/greens to lime and emerald greens that came from this mine - in general, this Turquoise is very hard and takes a glass like finish. This specimen above was cut by John Hartman from the Durango Silver Company Blue Gem Turquoise Collection. Again the Tonopah Blue Gem Turquoise Mine has been out of production for many years and this type of Turquoise has also become hard to find. 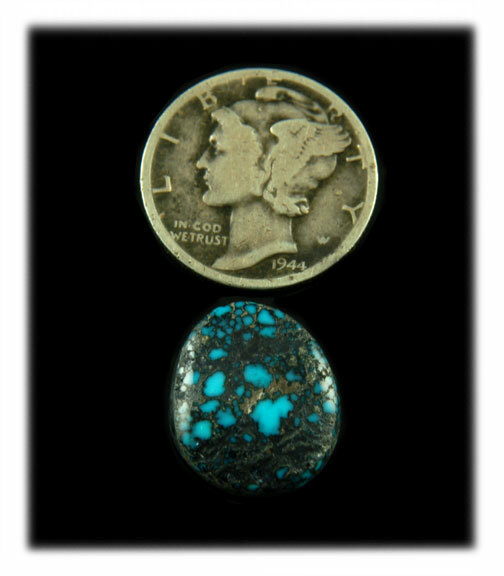 Above and to the left is an outstanding Manassa Turquoise Cabochon from the Kings Manassa Mine, located near Manassa, Colorado. Bill King, owner of the Kings Manassa cut this stone years ago. John, Dillon and Bill go way back and cherish many great experiences from their colorful past. The Manassa Turquoise Mine is believed to have been discovered by Native Americans nearly 2000 years ago. There may still be Turquoise in the mine, however, Bill has exhausted his search as the time and expense has overcome the amount of Turquoise being found. 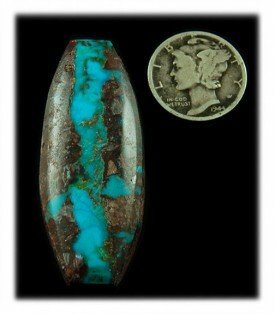 As you can see, this is fabulous Turquoise with a historic past, it is rare to find and very collectible. Learn more about the King's Manassa mine. To the right is a Turquoise Gemstone cut from the Pilot Mountain Mine, which are located northeast of Tonopah, Nevada. This grade of Pilot Mountain Turquoise is rarely seen as it is very scarce at the mine itself. Dillon and John Hartman mined this rock near the top of the Pilot Mountains many years ago - the rich deep blue in this fine stone is spectacular! This Turquoise grew in very fine seams or crevices in its host rock. It is shocking blue in person, it shows pretty well in this photo but it has more zat in person. The Morenci Turquoise Gemstone above and to the left has beautiful iron pyrite matrix, the iron pyrite sparkles like Silver and is very attractive. Iron pyrite was found in about 20% of the Morenci Turquoise taken out in the 1960's and 70's. When I cut this Morenci Turquoise Gemstone in the mid 1970's, I was overwhelmed with the beauty and I still have it today. Morenci Turquoise has that Arizona true blue coloration and is highly sought after by Turquoise collectors. The mine has not been producing Turquoise since the late 1970's. Above and to the right is a Morenci Turquoise Cabochon with wonderful character, it has what is called water webbing. Water Webbing in Turquoise is webbing in a darker color of the Turquoise instead of host rock. This gemstone came from a rock I purchased from the Brown Turquoise Company in 1974, located in Gallup, NM, at that time. Back then I was buying beer box flats of Morenci Turquoise and as I remember, I was paying about 120.00 per pound, it was mostly wafer material, I also purchased larger rocks that were deep blue with heavy iron pyrite spiderweb matrix for $250.00 per LB, however, the highgrade was very limited and you were privileged to get it. 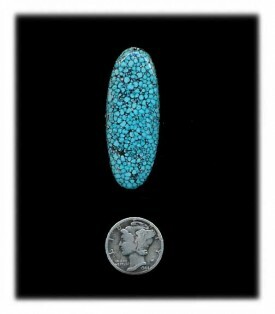 Above and to the left is a natural Kingman Turquoise Cabochon from the Kingman Mine located near Kingman, Arizona. The Colbaugh's ran into a large cash of spider webbed Turquoise rough in 2009 and have been finding small pockets of it periodically since. There are many variations in this spiderweb Turquoise from blue-green to rich blue with black spiderweb matrix. High Grade Natural Kingman Turquoise often has water webbing, red spider webbing and black spider webbing, it is available as it is located in the mine and years of mining will go by when they will find no Turquoise as good as some they have been finding lately. Above and to the right are three Turquoise Gemstones from the Number 8 Mine that was located near Battle Mountain, Nevada. This Turquoise was mined by Cutler Edgar in the late 40's and well into the 1960's. Estell (my wife) and I were very fortunate to mine Stormy Mountain Turquoise with Cutler, he had great stories about Turquoise mining and was a humble person. We got hundreds of pounds of Turquoise from Cutler in the 70's - Stormy Mountain, Number 8 and more and cut thousands of top gem grade natural Turquoise Gemstones. These Number 8 Turquoise Cabochons came from Cutler Edgar. John and Dillon cut natural gem cabochons on a daily basis, the more we sell - the more we cut. We have a very substantial collection of natural rough Turquoise that we have mined and collected over the past 40+ years. As we began in business as Turquoise Stone Cutters, we guarantee our cut stones to be exactly what we say they are. In addition, having cut well over a million carats of natural Turquoise, we have become leading authorities on Turquoise and it characteristics - John has been cutting Turquoise since 1972 and Dillon has been cutting Turquoise since 1992. 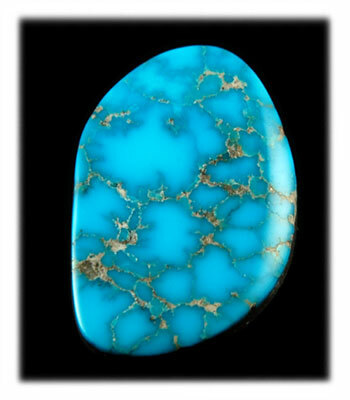 We specialize in American Turquoise, but we also cut Persian Turquoise, Tibetan, Chinese, Egyptian and Mexican Turquoise. If you are serious about obtaining exceptional quality Cabochons, talk to us! Above and to the left is a Bisbee Ribbon Turquoise Cabochon, this type of Bisbee Turquoise is scarce. 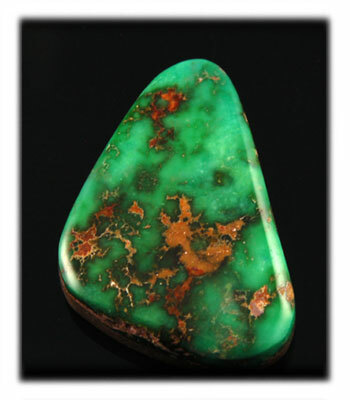 We cut this from a seam of Turquoise in the host rock, you rarely see Bisbee cut like this. The blue is deep and rich in color and runs through chocolate brown matrix and also includes smoky brown matrix. Above and to the right is spectacular Bisbee Blue Turquoise Cabochon that is very large and has smoky chocolate brown matrix. 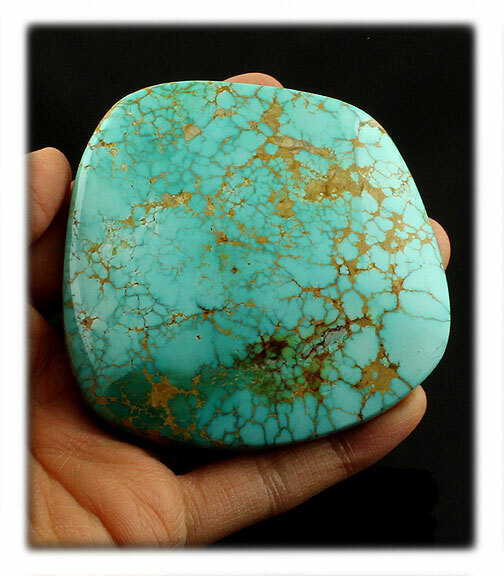 Smoky Bisbee Turquoise is very desirable by Collectors and it is not often available, especially in a stone as large as this. 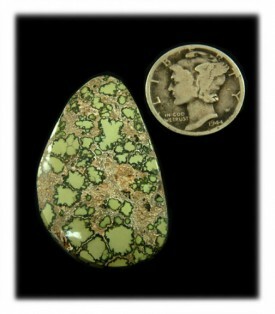 Check out other Bisbee Cabochons to see what we currently have available. Above and to the left is a beautiful Black Spiderweb Kingman Turquoise Gemstone hand cut by Bill King of Manassa, Colorado. This is a great example of natural high-grade Kingman Turquoise and it was cut by a very famous Turquoise miner, Bill King - Bill has been the owner for the King's Manassa Mine for over 50 years. He has been a Turquoise Stone Cutter since he was a young boy, he is now in his 70's. You can view additional information by clicking on the link in this paragraph. Above and to the right is a pair of Kingman Turquoise Gemstones with black spiderwebbing and they were cut by Bill King as well. These are two beautiful black spiderweb stones that match in size, shape, color and matrix configuration, if you are looking for a good pair of matching beauties for cuff links or earrings here is a great pair. 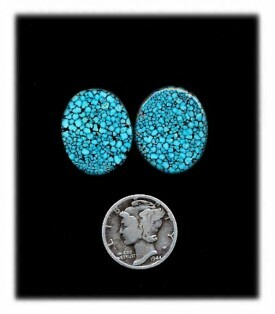 Also, Check out other Kingman Cabochons to see what we currently have available. Above and to the left is a large rectangular Royston Turquoise Gemstone in blue with tan, golden and chocolate brown matrix. It also has beautiful water webbing and shades of green coloration on one side of the stone. This stone would make a great Bracelet, Buckle or Pendant. This is rare ultra high grade natural Royston Turquoise from Tonopah, Nevada USA. Above and to the right is a nice collection of Royston Turquoise Gemstones showing a good range of the higher grade of Royston Turquoise. 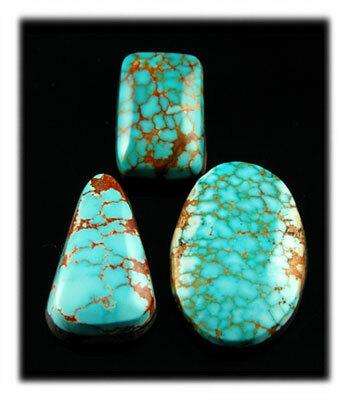 Each of the cabochons in this Royston Turquoise Cabochon Lot is unique with natural color and features light brown matrix. 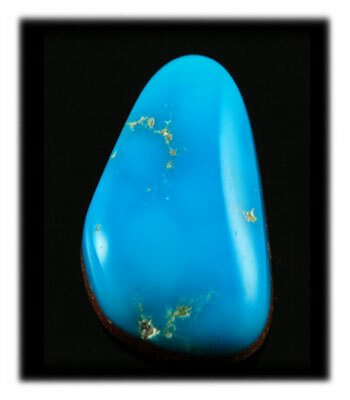 If you would like to view more Royston Turquoise Stones and information check out this page for other Royston Cabochons. Above and to the left is a rare old Persian Turquoise Cabochon with red spiderweb matrix. This is a large spectacular specimen is considered to be TOP GEM GRADE! It weighs 64.5 carats and measures 31 mm (1.25 inches) x 25 mm (1 inch) and it is has a 11.45 mm high dome - This Persian Turquoise came from old Turquoise Mines in Persia. Rarely available new Persian Turquoise comes from a number of mines in modern day Iran. The stones from all mines show a great color variation. Many mines were worked around Nishapur, 225 miles east of the southern end of the Caspian Sea, close to old caravan routes. Persian Turquoise has been highly coveted in the middle east for centuries. Firm evidence exists that Persian Turquoise these mines were heavily worked beginning in the 10th century, but there is also evidence that some of the mines near the surface may have been exploited as early as 2100 B.C. Persian Turquoise has been used in jewelry for thousands of years and will most likely continue to be used for thousand of years more. 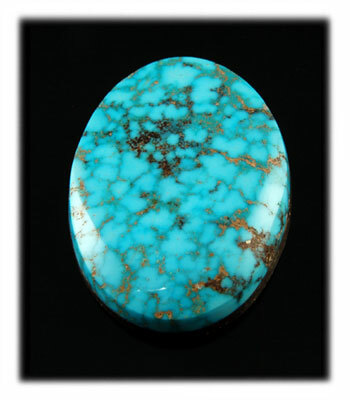 Learn more about Persian Turquoise. 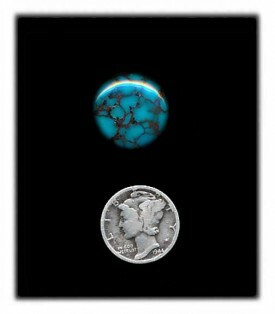 Above and to the right is a truly rare gemstone, an Authentic Lander Blue Turquoise Cabochon! 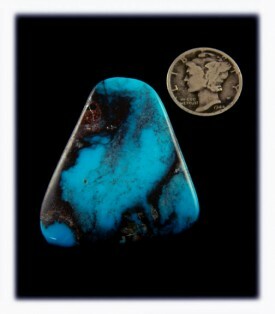 This is a six carat A grade cabochon of natural Lander Blue Turquoise from Nevada. Lander Blue Turquoise is the most valuable Turquoise in the world. This ULTRA RARE, top gem grade American Turquoise gemstone was bought in the 1970s from one of the original mine owners Marvin Syme. This natural Lander Blue Turquoise cab is a deep blue color and features fine, tight black spider web matrix, and the tell-tale golden brown matrix associated with genuine Lander Blue Turquoise. These gemstones have been lightly backed for easy of setting. The Lander Blue turquoise mine in Lander County, Nevada was first claimed in 1973, after it was sold to the owners by the discoverer Rita Hapgood, and produced some of the most beautiful spider-webbed turquoise ever discovered. Today it is considered the rarest and the most valuable turquoise known. Lander Blue was a very rich pocket discovery and has been referred to as a “hat mine,” a term used to describe small floats of turquoise because they could be “covered with a hat.” Less than 110 pounds (roughly 2 buckets) of this beautiful spider-web Turquoise was ever mined. This stone was cut by the miner in the 1970's and at that time they did not believe in filling the natural divots in the stones. - See more information on Lander Blue here. 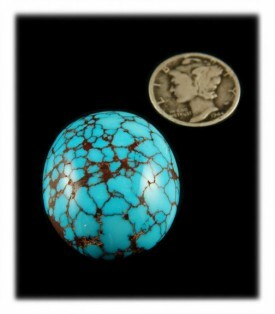 View additional Spiderweb Turquoise Cabochons in our gallery. Above and to the right is a beautiful hand cut Egyptian Turquoise cabochon by John and Dillon Hartman of Durango Silver Company. Until recent years this materials has been lost, sitting in the dessert un-mined. The mines have been re-opened, but the availability is limited and there is no idea how much Turquoise the ancient mines will yield as they have been mined heavily by the Ancient Egyptians. - View more info on this and see other Spiderweb Cabochons available here. 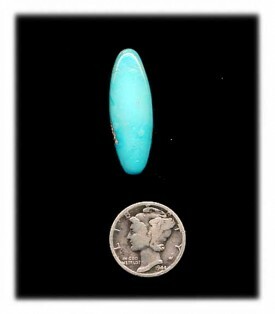 This is a great hand cut oval shaped Sleeping Beauty Turquoise Cabochon in a clear sky blue color. This is a long oval that would be great for a ladies ring, a nice ladies Turquoise Ring! It weighs 11.5 carats and measures 10mm x 30mm. If you like the photo, you will love the stone in person. Above and to the right is a very nice lot of rectangular authentic White Buffalo Turquoise Gemstones. The white Turquoise is brilliant and the black manganese is black/black, so the contrast is outstanding. The cut of the stones are made at a slight angle so when the turquoise gemstones are set, it will not fall out of the setting. The polish on these gemstones is a high quality mirror finish and superior to what you will get from most other stone cutters, we use the finest finishing equipment. 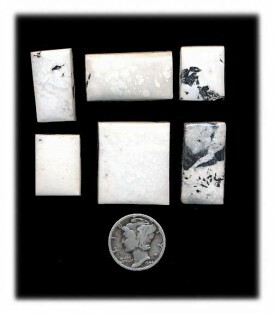 View the White Buffalo Cabochons we currently have available from Durango Silver Company. We invite you to view our exceptional, authentic Turquoise Cabs Available today! We invite you to learn more about Turquoise Gemstones by following the links in our Learning Center to other informational pages we have written on different topics directly related. In addition, we invite you to join our E-Mail Newsletter - about once every other month we send out a Newsletter to inform our members of what's happening with Durango Silver Company, new products, specials for our members only and more. Please take a moment to become one of our friends by signing in below. We hope you have enjoyed our presentation on Turquoise Gemstones and have gained some useful knowledge from it.